NEW TO OUR RENTAL PROGRAM! 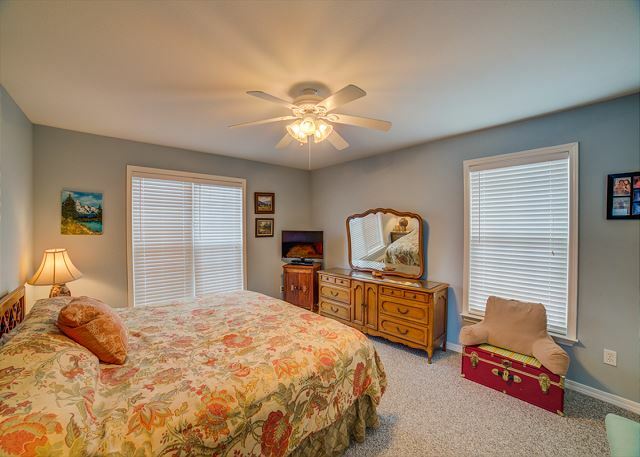 There is a lot to like about this three-bedroom, three-bath home. There is a large covered deck on the Gulf facing side of the main level. There is also a roof top sun deck which can be accessed from the deck on the main level. French doors from the main level deck lead directly into the large family room which includes living, dining, and kitchen. The bunk room has two sets of bunk beds, one of which is a twin-over-full. This bedroom shares a hall bath with the living area. 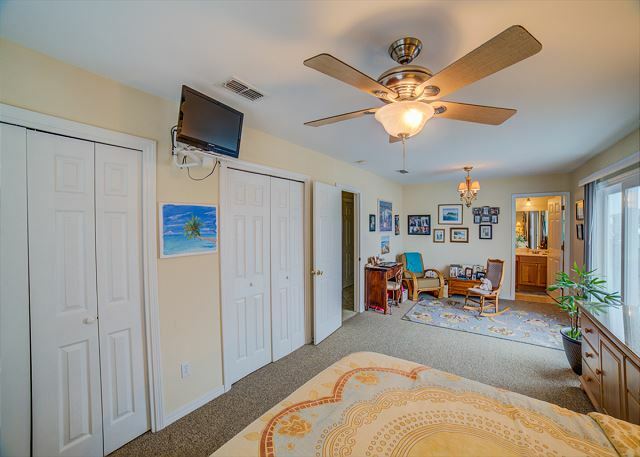 There are two additional bedrooms, one of which has a king bed (master) and private bath, while the second has a queen bed and a private bath. 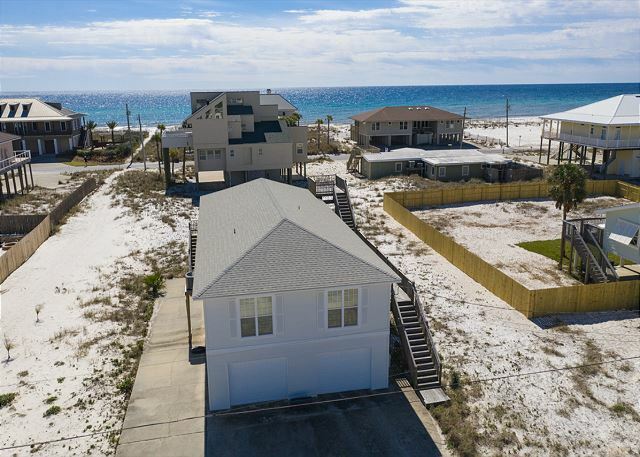 This home is located an easy one block walk from the beautiful white sands of Pensacola Beach. 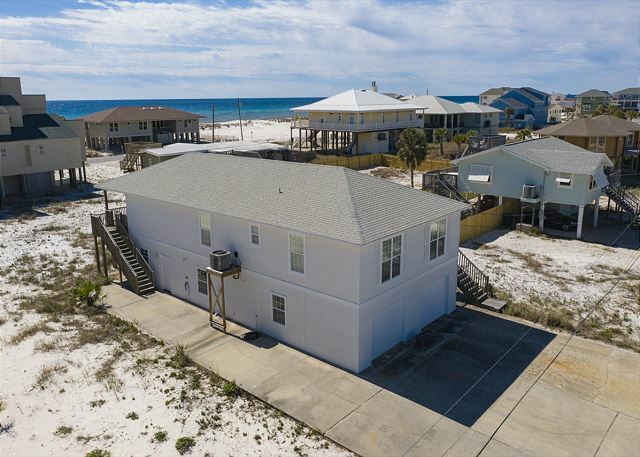 Between the driveway and the garages there is ample parking for six plus vehicles. This is a really great vacation home for the entire family. Pet and event friendly too! 200 steps to the beach. Had the beach to ourselves. Location is great, away from the busy hotel district. Lots of good local food as well. House was very nice. All the amenities you could need. We loved it and plan to go back! We enjoyed our stay. The house was clean and perfect for our family of 7, including the 3 "twenty-something" kids and 2 young children. The house is just the perfect fit for our family. It allows everyone their private space while we can get together in the kitchen/living room. The covered porch is awesome and where my parents spent most of their time enjoying the view and breeze. The house was adequate with a good location, however, the blender was broken, the dishwasher did not work, there were dirty pots and pans probably due to the dishwasher not working. We try to go to this area every year about this time. The house was very clean and had all the things we needed for cooking and playing. I was so surprised there were Kayaks and an ice chest and it was great there was a fridge in the garage for easy packing up for the beach. Great neighbors! Can't wait to see if we can get this house again next year. Only thing I would ask for would be to have more hangers and cushions for the balcony furniture. Not the best house, but perfect for the price and location at a late minute notice. Very satisfied with home.